Bear Kminek has a BIG BOAR hog! Grace Leonardi got this big elk! Not something you see every day in Charleston! Reading and watching all the buzz about marrow bones... We decided to cut a few. And did you know we don't charge $50 per lb? I haven't tried any of these recipes yet so send me some feedback if you do. Lengthwise cuts of marrow bones are $3.99 per lb. Be sure to call before you come out as we don't have regular hours in the off season. The Glover Family had a good 2012 season! Camo dipped skulls - Contact Kenneth for details. Fresh, never frozen Cordray Farms steaks in the refrigerated case and taking orders now for July! The summer is marching on! It's the perfect time for grilling. We're cutting beef this week and have added just a few of the very best cuts to the refrigerated case. If you are looking for some 1 1/2 inch thick Porterhouse steaks for an amazing grilling choice, stop by this week Mon - Wed 9 to 5! We're taking Side orders now for the first week in July. Give us a call and we'll walk you through the ordering process. It is the most economical way to buy our beef at $3.50 lb. precut weight. You'll get about 300 lbs. of custom cut beef portioned just exactly right for your family meals. Need a little less quantity? We'll also have Shares, 1/8th of an animal, cut and frozen for you. All of our cows are born and raised on our farm. We know what they eat and exactly how they're handled every step of the way! I had a customer tell me just this week that he ordered a Share because his friend said that once you've had Cordray Farms beef, you'll never go back to the meat counter at your grocer again! Be prepared to be impressed. Cutting beef here this week... Putting just a few in the case so they'll be fresh, never frozen. These are 1.5 inch dry aged Porterhouses. Jamie and Jake, I think it's got your name on it! Open 9 to 5 Mon., Tues., and Wed. this week. Contact SC Department of Natural Resources to get information on applying for alligator tags. Click here to see the details of public hunting for alligators in SC. 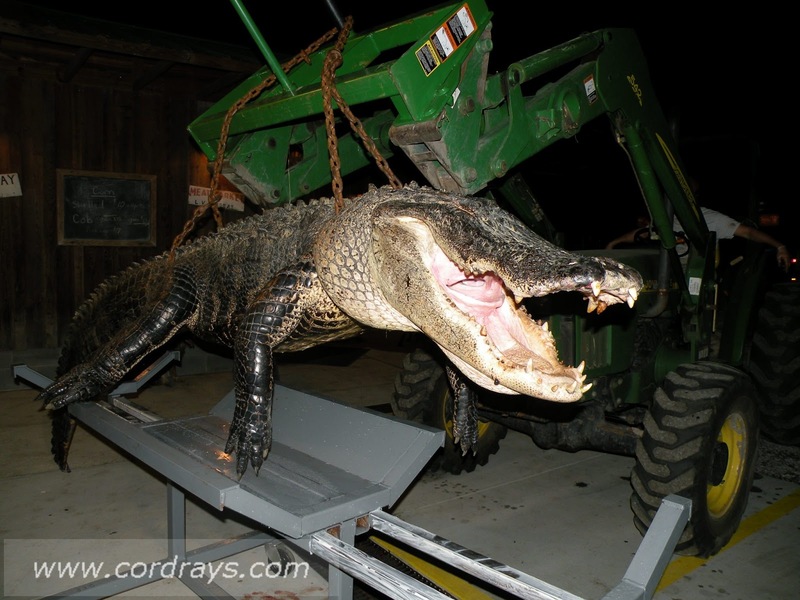 See what you might miss if you don't apply for your alligator hunting tags? Applications end June 15th.